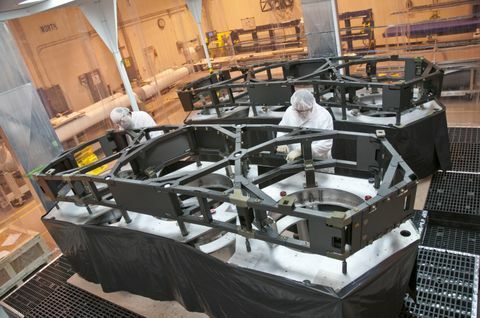 REDONDO BEACH, Calif., March 14, 2013 -- Northrop Grumman Corporation (NYSE:NOC) and teammate ATK (NYSE:ATK) have completed the fabrication of the primary mirror backplane support structure (PMBSS) wing assemblies for NASA's James Webb Space Telescope. Northrop Grumman is under contract to NASA's Goddard Space Flight Center in Greenbelt, Md., for the design and development of the Webb Telescope's optics, sunshield and spacecraft. The primary mirror backplane supports the telescope's beryllium mirrors, instruments and other elements during ground test operations and launch. It holds the 18-segment, 21-foot-diameter primary mirror nearly motionless while the telescope is peering into deep space. The deployable wing sections complete the backplane structure while providing thermal stability. Their unique folding design permits the telescope to fit in the five-meter fairing of the launch vehicle. "Our ATK teammates have met unprecedented thermal stability requirements," said Charlie Atkinson, deputy Webb Optical Telescope Element manager for Northrop Grumman. "The team has done a commendable job of completing the PMBSS wing assemblies." Measuring approximately 24 by 21 feet, and weighing more than 2,000 pounds, the primary mirror backplane support structure – which includes the wing assemblies as well as the center section that ATK completed in February 2012 –must meet unprecedented thermal stability requirements. While the telescope is operating at a range of extremely cold temperatures, from -406 to -343 degrees Fahrenheit, the backplane must not vary more than 38 nanometers (approximately 1/1,000 the diameter of a human hair). For reference, if the mirror were enlarged to span from Los Angeles to New York City, the tolerance for error would be less than 1 inch. The wing assemblies of the Webb Telescope's primary mirror backplane support structure were designed and fabricated and will be tested at ATK facilities in Magna, Utah. ATK designed and built the 900 composite parts of the wing assembly using lightweight graphite materials and advanced fabrication techniques. The composite parts attach to precision metallic fittings that provide interfaces with the other elements of the observatory. "The completion of the backplane wing assemblies continues to demonstrate state-of-the-art engineering and fabrication supporting this great NASA program," said Bob Hellekson, ATK's Webb Telescope program manager. "We are proud to be a partner in building this amazing telescope." ATK is an aerospace, defense and commercial products company with operations in 21 states, Puerto Rico and internationally. News and information can be found on the Internet at www.atk.com .